Trooper Zach Lenderman (right) is the primary investigator. Lenderman was assisted by Trooper Kevin Burman (left). 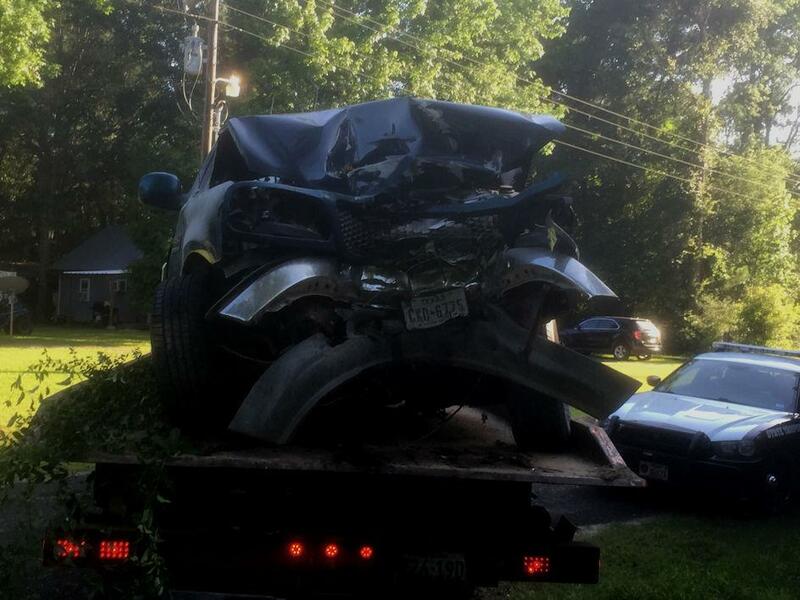 Driver Slams Into Tree, Alcohol Suspected, WILD COUNTRY, July 3, 2016 - At approximately 5:18 pm on July 3, 2016, a green 2000 Ford F-150 driven by Joshua Cody Phillips, 25, of Livingston, was south-bound on Hillbilly Heaven Road. Phillips' pickup left the pavement to the left and slammed into a large tree. According to witnesses, the pickup caught fire and Phillips was reportedly trapped inside. The South Polk County Volunteer Fire Department was dispatched to the scene along with Americare Ambulance Service, Deputy David Sottosanti with the Polk County Sheriff's Office and Troopers Zach Lenderman and Kevin Burman with the Texas Highway Patrol. Volunteers used a fire extinguisher to put out the fire and pulled Phillips from his truck. Phillips was treated at the scene, then transported by ambulance to a nearby landing zone where PHi Air Medical Helicopter landed and flew him to Conroe Regional Hospital with serious injuries. Traffic on Hillbilly Heaven Road was blocked during investigation and cleanup. Alcohol is suspected as Phillips smelled strongly of alcohol, had and open can of beer in his truck, and a cooler loaded with iced down beer. Phillips is facing a possible charge of driving while intoxicated. He was also cited for unsafe speed. A rollback wrecker from Ken's Towing recovered Phillips' vehicle and it will be stored at Harrison Body Shop in Livingston. WARNING: The images below show scenes from a violent single vehicle accident. There's a small amount of blood in one picture. If this offends you in any way, DO NOT scroll down this page. 25 year old Joshua Cody Phillips, of Livingston, crashed this 2000 Ford F-150 into a large tree off Hillbilly Heaven Road. Powder from a fire extinguisher is visible on the hood of Phillips' pickup. According to witnesses, the truck caught fire. Volunteers managed to get the fire put out. Phillips lays in the grass as he's tended to by emergency personnel. Trooper Lenderman found an open container of beer inside Phillips' truck. There was also a cooler filled with iced down beer. Phillips was loaded into an ambulance and transported to a landing zone. Phillips was flown to Conroe Regional Hospital with serious injuries. Phillips' vehicle was recovered by Ken's Towing.